Charter a private flight to Charlotte, a major city and commercial hub in North Carolina. Renting a private jet to either (KCLT) Charlotte Douglas International Airport or (KJQF) Concord Regional is the most comfortable and convenient way to get in and out of the city, and our team offers the highest standards in executive and leisure travel. Air Charter Advisors offers on-demand private jet charter service to/from Charlotte, North Carolina. With access to thousands of jets around the world, we’re confident we can arrange the right aircraft for your trip, whether flying internationally or domestically. Wyvern-certified, our private jet charter company only uses aircraft that are operated by FAR Part 135 (or foreign equivalent) air carriers for charter flights to Charlotte. Our list of clients includes heads of state, C-level executives from major corporations, celebrities, personal assistants and leisure travelers from around the world. Enjoy the peace of mind you get from working with a jet charter broker you can trust, and we’ll be your local and global aviation solution for luxury air travel, aircraft acquisition and private jet management. Call or request a quote for your upcoming flight to Charlotte. Our team is here to help you with all of your private aviation needs or accommodating any other special requests – consider our Charlotte Jet Charter service your one-stop shop for all things private aviation in North Carolina. Air Charter Advisors believes in providing private jet travelers with a one-on-one consultative service experience that exceeds every expectation. We understand that your time, privacy, flight preferences and most of all, safety, are all extremely important when arranging your charter flight. With our representatives available for you by phone and email 24 hours a day, 7 days a week, you can contact us at any time. When using our private aviation service, you can expect quick response times and an easy, hassle-free booking process. Our Charlotte Jet Charter brokers can arrange everything from multi-leg private flights with in-flight catering to luxury ground transportation and helicopter lifts. We also review potential one-way pricing and empty-legs to offer the most cost-effective quotes possible. Request a quote or call us to arrange your private jet charter flight to Charlotte, North Carolina. Fly private in a luxury jet to Charlotte and have a great weekend in a city that delivers surprise after surprise. Those that aren’t familiar with this somewhat-hidden-gem are in for a treat. It seems like everyone that goes to Charlotte comes away with a vastly different experience. Its southern location mixes with its metropolitan vibe in a way that’s striking in how different it can be depending on the time and district. However, one thing remains true for each person that visits. Namely, it’s one heck of a great time. Whether you’re hiring a business jet and need a fun happy hour with a sympathetic bartender, or you’re flying private jet charter with family and the museums and outdoors take precedence, you’ll have no problems finding just what you need – and we can arrange the right aircraft and flight itinerary for your needs. With downtown and uptown districts that rival those of America’s biggest cities, a theme park with tons of scream-inducing rollercoasters, and outdoorsy activities that will make you feel like you’re miles from any city, Charlotte will have you coming back again and again. After your jet arrives, Take a stroll through the extremely walkable downtown during happy hour and you’ll find a ton of custom cocktail and craft beer establishments, along with several sports bars and gourmet restaurants. If you’re looking for a slightly more refined night out, stop by The Punch Room on the 15th floor of The Ritz-Carlton. They mostly deal in single-malt scotches and obscure wines that you’d have a tough time finding anywhere else in the state. Combine their inventive menu with unrivaled views of the city skyline, and you’re in for one very memorable evening. While the nightlife in Charlotte is attractive, it’s far from its only asset – just outside of the metropolitan area is some of the best hiking in the state. Crowder’s Mountain State Park boasts two trails meandering up towards two separate peaks which, on clear days, offer unrivaled views of the skyline. And, of course, the iconic Blueridge Mountains are always looming just outside of the city, ready for ambitious hikers and campers alike. If you’re heading to Charlotte in a private jet during the summer and want to stay close to air conditioning, there are enough museums to keep you busy for a week. Of these however, one stands out in particular. The Mint Museum Uptown features and internationally renowned collection of American, contemporary, and European art that amazes art critics and casual onlookers alike. Book a private tour with a knowledgeable guide and reserve a seat at their in-house gourmet restaurant, Halcyon, for an educational experience that you and your family will remember for years to come. Whatever you decide to do after your jet lands, whether it’s outdoorsy fun or a pub crawl through uptown, Air Charter Advisors can make your trip there as comfortable and relaxing as possible. Available 24/7, our representatives can arrange multiple aspects of your trip. Request a quote or call to arrange your private flight to Charlotte, North Carolina. 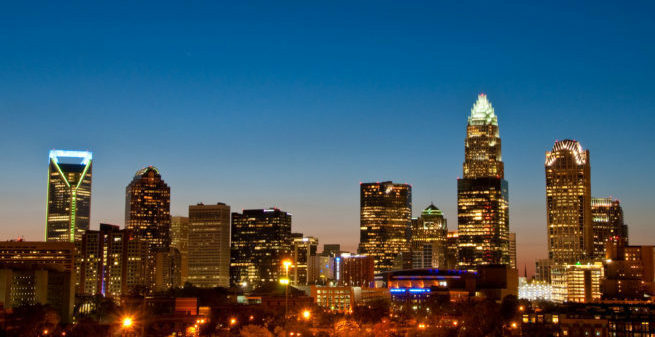 Book a flight to Charlotte for your next business event or weekend getaway. Claiming a whopping 25 million visitors annually, Charlotte is no stranger to private flights. Eight airports within an hour of the city make it an extremely convenient destination for charter flights, while an amount of hotels and B&B’s that borders on the absurd gives each private jet traveler the flexibility to choose exactly what suits them. Head over to the city’s skyscraper laden uptown district after your private flight lands and have your pick of the litter from the various hotels among the enormous buildings. Or if you want to relax in a quieter environment, tell your driver to head for Hermitage Road for a drop off at the decadent Duke Mansion. Southern charm and contemporary luxury pervade each of the twenty lavishly appointed rooms, while picturesque gardens span the quaint 4 acres that the Duke Mansion rests on. Or you can be in and out of the city quick with the armada of business and design hotels that occupy the downtown and uptown districts. The Omni Hotel, with its comfortable rooms and gourmet dining options, makes for an excellent overnight stay after a work event. Most hotels near the (CLT) Charlotte Douglas International Airport offer in house bars and restaurants, making it easy to kick back and relax without having to go anywhere. But with this many options, picking just one can be a bit tricky. Charlotte Jet Charter is determined to fulfill every private jet traveler’s needs, so we’ve put together a list of the top hotels in the area. Based on jet charter clientele feedback, online reviews, and amenities offered, there’s sure to be something on the list that piques your interest. Check out the list of the hotels most suited to private jet travelers in and around Charlotte, North Carolina. Air Charter Advisors utilizes the following airports to offer private jet charter service to/from Charlotte, North Carolina and neighboring areas. Charlotte Douglas International Airport (IATA: CLT, ICAO: KCLT, FAA LID: CLT) is located 9 miles west of downtown Charlotte, North Carolina. It’s a joint civil-military public international airport, serving as the second largest hub for American Airlines after Dallas/Fort Worth International Airport. As of 2015, it ranked as the 6th busiest airport in the nation in terms of passenger traffic and aircraft movements. (KCLT) Charlotte Douglas International serves as a major gateway for flights heading to the Caribbean, and is a popular jet shuttle route to/from Atlanta for business travelers. It’s also one of the few airports in the country with a public viewing area, where visitors can watch jets take off, land, and taxi to and from runway 18C/36C. Other facilities include 6 concourses and an FBO operated by Wilson Air Center. 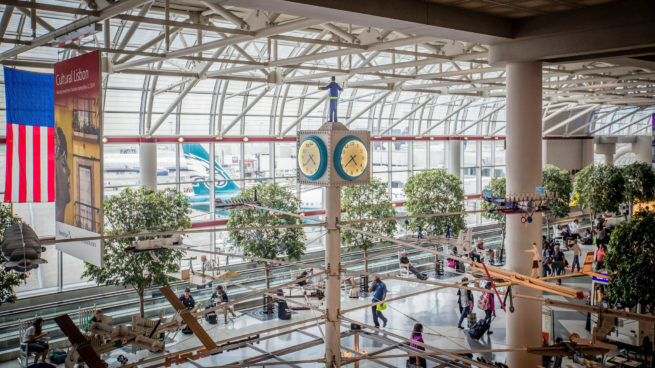 (CLT) Charlotte Douglas International Airport is also one of a small number of major airports with an aviation museum located on the field. The Carolinas Aviation Museum was established in 1992, and features a collection of over 50 aircraft. In 2011, the museum acquired N106US, the US Airways Airbus A320 Captain Chesley Sullenberger landed in the Hudson River during US Airways Flight 1549 in 2009. Located 7 miles (13 km) west of Concord’s central business district in Cabarrus County, Concord Regional Airport (IATA: USA, ICAO: KJQF, FAA LID: JQF) is a city-owned, public-use airport classified by the FAA as a reliever airport for (KCLT) Charlotte Douglas. Although many airports in the U.S. have the same three-letter identifier for the FAA and IATA, (KJQF) Concord Regional is assigned JQF by the FAA but had no designation from the IATA until 2013, when it was assigned the IATA code USA. (JQF) Concord Regional features a single 7,400 foot runway (2/20) with an asphalt surface, allowing turbo-props, light jets and mid-size jets to utilize the airport. Concord Regional is also part of the Air Elite Network of FBOs. Since it’s runway expansion to accommodate larger private jets in the early 2000’s, several NASCAR racing teams now base their aircraft fleets at Concord Regional, earning it the nickname “NASCAR’s Airport”. 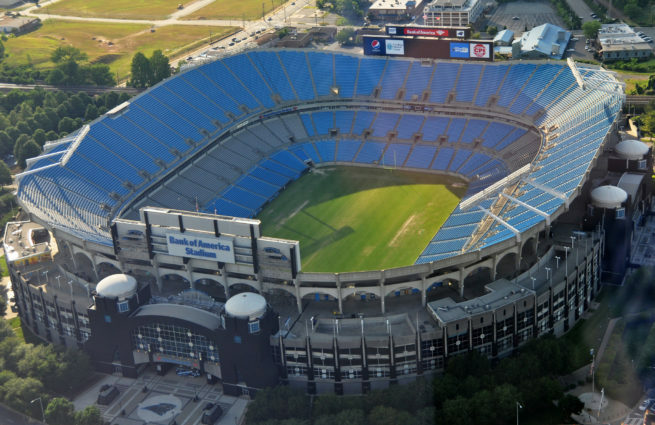 Motorsports teams often charter their jets out of Concord Regional instead of Charlotte Douglas due to its affordability and proximity to their headquarters; the airport’s proximity to I-85 offers convenient access to Charlotte Motor Speedway and the Z-max Dragway. Request a Quote or give us a call at 1-888-987-5387 to speak with one of our Charlotte Private Jet Charter agents for your next luxury vacation, business trip, or special event.